I got my new tools on Friday! WOO HOOO! I am very excited to start using them! 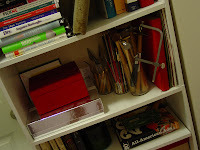 See how nice they look with all my other things on my shelf!? But before I dig in, I need to get some base metal to practice on before I start using other metals! I want to be good and ready before I try anything that could lead up to a very expensive mistake!! Any tricks/tips are welcome as the last time I did metalsmithing was in a jewelry class! It will be much harder to make decisions without a teacher around! I got some great books at the library to help with any questions I have. They all have been extremely helpful already! I hope to have some simple designs up to my Etsy shop before long, so check back here to see my progress!!! This weekend my parents were in town! I had such a great time with them. They went antiquing on Friday and Saturday around the area and to an auction on Saturday and Sunday. My parents and I have been interested in antiques for quite some time now. They have the most beautiful furniture and pottery! Hopefully someday I will be as skilled as they are when picking out antiques! On Saturday night we went out to the casino/racetrack for some random fun. We enjoyed the gorgeous night while betting the minimum on horses!! My dad was the big winner of $0.80!! HAHA!! WOOOHOO!!! Since nothing too interesting has been going on the last few days I thought I would post pictures of my 15 minutes of fame on Etsy. 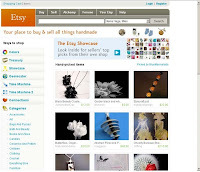 Over the Easter weekend my Black Beauty earrings made it to the front page of Etsy!!! I was sooo excited! I thought I would never get a chance to be on the front page! My item was even sold not too long after it made it's dazzling appearance! A few weeks back Bloomingliliy featured my fabulous Customizable Flourish Notecards on her blog! What an honor to have someone feature something of mine! **blushing** These notecards are a favorite of mine as it gives you the option to say whatever to whomever you want! Perfect for the times you just don't have the guts to say what's really on your mind! Check out the article if you have a moment! 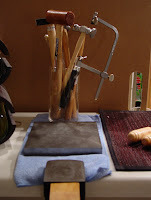 I finally did it, I took the plunge and ordered some metalsmithing tools. After browsing countless websites and local stores I realized that I could only get the bulk of my tools online. $150 later, I will have sufficient tools to do cold joinery. I will not be soldering anything yet due to (very) expensive torches and a smaller than small living space. I soon hope to be back as a full on metalsmith, but I think I should just wet my feet a bit before diving right into it. My tools should be here by Friday, I am so excited! Now I need to get some sheets of metal to practice on before I just start working with sterling silver. I have gotten a few recommendations from fellow Etsyians on places to by sheet metal and have been busy looking them over. I will be documenting the start up of my newest endeavor so check back often with updates on my (hopeful) progress! This morning I woke up to a sunny sky so bright it forced me out of bed. But once I set up shop in the living room the sky turned a dark gray. Very gloomy! As I flipped through the channels I noticed that Planet Earth was on the Discovery channel. Everyone has been talking about it at work so I turned it on and was hooked! (Good thing a marathon was on today!) The cinematography was amazing. I encourage all of you to check it out if you haven't heard of it. The Discovery channel has short clips of each episode that sucked me in last week, just make sure you have some time to watch them all! A good hour of my time at work was wasted watching these videos! oops! The picture above is a bracelet I made last night. I got these Tibetan Silver clasps a while ago and haven't figured out what to do with them. As soon as inspiration hit, I grabbed my jewelry box and went to town! Check it out! Today I had the pleasure of meeting a few fellow etsy designers during Craft Saturday at the 'muse. I met and chatted MAugustaWoodland and JadeScott among a few others. I have to say these designers have really great products! Stiff competition! I hope to do the next Craft Saturday in June and I am really excited! This will be my first craft show so please come check it out and give me moral support! I have wanted to start a blogspot for a while now and today I woke up thinking, "all right, just do it". I figured that I would just use JustAnotherDay as my site name to match my etsy address but much to my dismay it was already taken to a high school girl who has posted once in the last 4 months. blah! In comes my dilema. What SHOULD my new name be? I thought about this forever and typed in various names it could be, all taken too! Finally, I decided on two: JustAnotherDayDesigns and JustAnotherDaysPerspective. After chatting with a few Etsyians and my gut feeling JustAnotherDayDesigns.blogspot.com was born.